First off, don't get too excited. 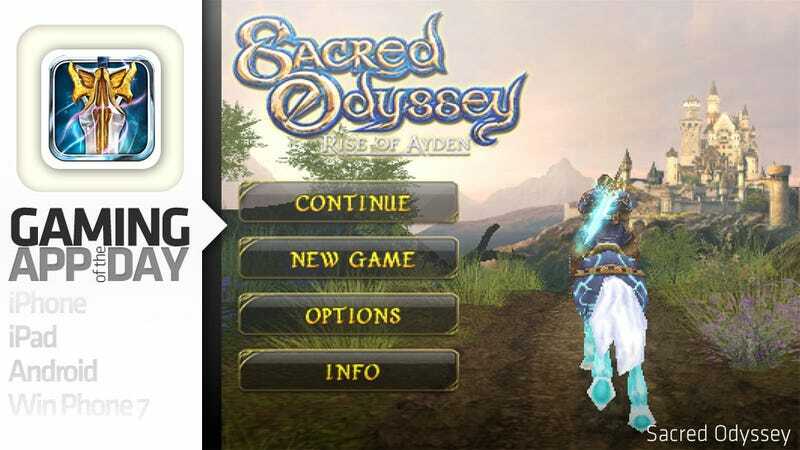 The game shows up as free on the iTunes store, but Sacred Odyssey is actually a limited version of the full game, upgradeable via a $6.99 in-app purchase. It's comes across as a little sneaky and underhanded to me, but I suppose it beats being tricked into buying the game outright. How Zelda is it? Well one of the first quests I went on involved me corralling goats. I've got a sword and a shield, and can dramatically roll about on the ground, but no jumping. I need to reunite the 4 fragments of Uryah's Grail and gain supernatural powers to defeat Amonbane, the dark lord seeking to destroy Lasagnaglen, or Lasgalen. Princess Lyanora helps me along the way, while treating me like a second-class citizen now and again. There is voice acting for much of the important quests, and the main here is a man instead of a young mute elf boy, but for the most part, here we are; Zelda lite. Anyway, the game is free to try, $6.99 to buy, and it is available now for the on the iTunes App Store.